Pre-heat oven to 200°C/390°F. Peel and finely grate ginger. Finely dice garlic and chili. Add ginger, garlic, and chili to a small bowl. Add lime juice, soy sauce, honey, and half of the sesame seeds. Mix to combine and set aside. Core the bell peppers and cut into bite-sized pieces. Wash the head of broccoli and cut into florets. Remove the stems of the mushrooms and cut into quarters. Peel and cut carrot into bite-sized pieces. Finely dice the white part of the spring onions, and cut the remaining green part into small rings and set aside. Add the bell peppers, broccoli, carrots, and the white part of the green onions to a large bowl. Cut chicken breast into wide strips and set aside. Pour half of the sauce onto the vegetables and mix well. Season with salt and pepper. Grease a baking sheet with vegetable oil and spread the vegetables over it. Bake at 200°C/390°F for approx. 15 min. Remove baking sheet from the oven. 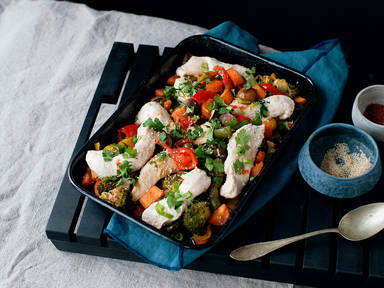 Drizzle the remaining sauce over the chicken breast and lay the chicken breast on the baking sheet with the vegetables. Bake at 200° C/390°F for approx. 10 minutes or until chicken is cooked through. Top with green onion rings, the remaining sesame seeds, and cilantro to serve. Enjoy!